Maria I. Rosario, age 90, longtime resident of Fredonia, N.Y., died Friday September 28, 2018 at her home with her loving family at her side. She was born September 1, 1928 in Maricao, Puerto Rico. Maria was a member of the Iglesia Getsemani Church. She enjoyed knitting. Above all, she was a kind, caring and loving mother, grandmother, great-grandmother and great-great grandmother who loved spending time with her family, especially her daughter Maria, who was her caretaker, and her son Ray. Maria is survived by: her 5 children: Iris M. Rivera, Damian (Santa) Rivera, Maria V. Rivera, Manuel (Alba) Aquino and Raymond Aquino; 15 grandchildren, 27 greatgrandchildren and 6 great-great grandchildren; and 2 sisters: Rosa and Heriberta Rosario. Maria is predeceased by 3 brothers: Rafael, Ramon and “Coco” Rosario, and 1 sister, Margaret Rosario. Calls may be made Tuesday from 6-8 pm at the LARSON-TIMKO Funeral Home, 20 Central Avenue, Fredonia, N.Y. and Wednesday from 11 am-1 pm at the Iglesia Getsemani, Church, 115 Central Ave., Dunkirk, N.Y., where funeral services will follow at 1 pm. Entombment will be in St. Mary’s Cemetery Mausoleum. On-line condolences may be made at larsontimkofuneralhome.com. Arrangements by David J. Dengler, LARSON-TIMKO Funeral Home, 679-9000. 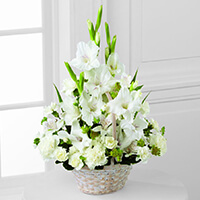 To send flowers to the family of Maria Rosario, please visit our Heartfelt Sympathies Store. My most heartfelt condolences to you all. May she Rest In Peace! Our Condolences are with you are your family during this time. May your heart and soul find peace and comfort. The Kingdom of Heaven has gain a beautiful angel. Your passing has really broke me into pieces but I know you wouldn't want to see me cry. I will forever love you even if you are no longer with us. Thank you for being such a wonderful loving caring grandmother. Your wisdom made me the man I am today. Rest in peace my beautiful angel. Te Quiero mucho abuela. No vesmos un dia otra vez. Querida familia Rosario, Por favor acepten mi más sentido pésame en estos momentos. Le invito a meditar en esta bella promesa que a ayudado a muchos en tiempos como estos. Juan 5:28,29 dice- “No se maravillen de esto, porque viene la hora en que todos los que están en las tumbas conmemorativas oirán su voz y saldrán...a una resurrección” Aquí vemos la promesa de Jehová de devolverle la vida a nuestros seres queridos. Podemos estar seguros de esta bonita promesa.